Take a couple of days out from your normal life to create a figure in clay. We provide the model, tuition, clay, oh, and the perfect environment for total absorption! Taught by Karin Ort, she will take you through the whole process of creating the human form, getting your proportions right and preparing your model for firing. It can be as figurative or abstract as you like – the choice is yours – and Karin will help you create your artistic vision. Once finished the piece will be allowed to dry out and, once dry, will be fired in one of our kilns. It will then be yours to collect, take away and keep. Learn how to build up the figure, really focusing on where parts of the body sit in relation to each other. Focusing on the negative space around the model and getting your proportions correct. Adding more detail and facial features as the day progresses. Learn how to construct the key features of the form – face, hands, feet and hair. Prepare your piece so that is ready for firing in your kiln. Working on the surface pattern and finish of your piece, deciding what level of detail to work to. Anyone. Though we generally advise that students be 16 years old+ though exceptions can be made where appropriate. Nothing, bar a packed lunch and maybe an apron if you want one! If you wanted to continue exploring clay then you could make pieces at home and bring them here for firing. We also have two mid week classes that you could join – one taught, one untutored (a waiting list may apply). Equally you can sign up for another weekend course! Karin Ort is the cofounder of the Phoenix Studio. Always creative from a young age, Karin discovered clay modelling in 1995 when she started doing weekend courses with Mary Orrom at Great Missenden. She then studied for a part time National Diploma in ceramics and surface pattern at Barnfield College, then enrolling on an HNC in 3-dimensional design. 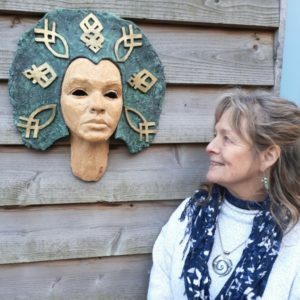 In 2004 she started running sculpture workshops at the studio. These sessions proved so popular that over the last 14 years she has introduced many people to the delights of modelling in clay. Karin has an exceptional eye for detail and is able to guide and encourage students through to reaching their creative potential. When not teaching at the studio, Karin produces her own work, selling it at exhibitions and through commissions. This was my third trip to the Phoenix Studios, having done a couple of the animal clay courses. I was quite apprehensive about my ability to create a life model but Karin remained calm and positive throughout, guiding us all to produce some amazing pieces. The atmosphere was most supportive , with Karin looking after both students and model with care and consideration. I would highly recommend the weekend to anyone , you will be delighted by what you achieve! WOW! If you’re wondering/contemplating…stop and book it NOW! If I can do it, so can you! What a fabulous weekend! It was fun, rewarding, relaxing, stimulating (can it be both? -yes it can apparently! ), exciting, therapeutic…just wonderful. I shouldn’t have put it off for so long! Karin is a fab teacher and everyone on the course was so friendly and kind. It was great to be learning and achieving in such a lovely nurturing environment.